After laying down the strings to demarcate the wiring paths, it was time for the construction crew to turn design into reality. As you can see in the wiring plan, there are two prime areas of complexity: Grand Central (which lives under the large control room window) and the audio eQuipment Room (which we call the QR. 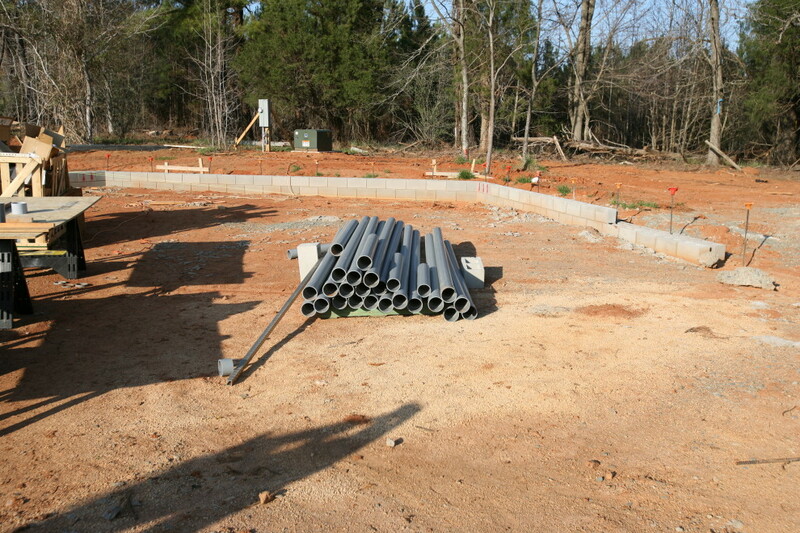 The first week after laying down the string was mainly concerned with transition and logistics: getting the 4″ PVC Pipes, the gravel, and other prep work. 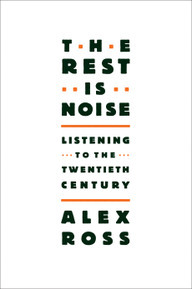 I had a chance to read Part I of The Rest is Noise, and I am happy to report that the book has more than fulfilled the breathless promises made on the back cover. It is astounding. The New York Times has a lengthy excerpt of the first chapter. I don’t know about you, but when I read this text in the actual book it brought tears to my eyes. Several times. Does it have the same effect on others? My apologies that there was no week 9. 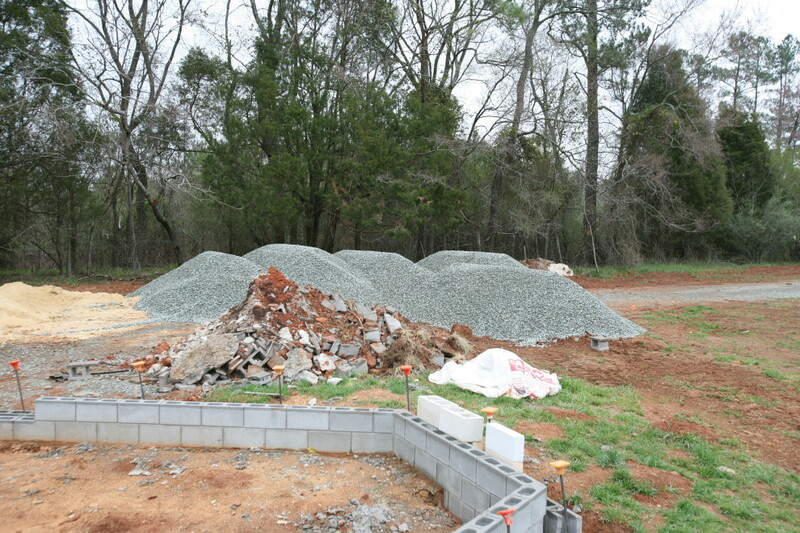 There was no visible progress as most of the work was finalizing the order for the blocks. The order is in, and we expect deliveries in about 4 weeks and the last blocks to be delivered by the end of April. Yipee! I read a fair number of books, though not nearly as many as Amy. And many times when I discuss these books with others, they say “can you send me your reading list?” Well, I’m going to start a new category on this blog, which is books and it will be used whenever I reference a book that’s relevant in some way to the experiment that is this studio project. I visited our local bookstore this morning (talk about a business that’s almost as bad as the studio business) and saw The Rest Is Noise and had to pick it up. First, because the topic “listening to the twentieth century” is of great interest to me. Second, because the cover art is fantastic, and third because the inside jacket cover presented to me the very insight that has inspired me to create The Miraverse inside of Manifold Recording. Namely, while paintings by Pablo Picasso and Jackson Pollack sell for hundreds of millions of dollars, the equally influential music of the twentieth century struggles against the presumption that music is a dying art. I have not yet read page one of the book, but here is what I’ll be attending to: I believe that we are presently (in 2008) discovering that consumerism is the true dead end. Not only does it kill the authentic self, but it’s destroying the earth as a habitat for humans as well. The fixed media form of art is particularly conducive to high valuation because it is unique and excludable. The diffusive form of music, which must be shared to be experienced, and which notably does not exist except when performed, presents a much greater challenge. All sorts of changes in copyright laws and other statutes to make music more like a painting have largely failed to create the ever-appreciating values we have seen in the world of paintings. I believe that the problem with music as an industry is that we’ve tried to make it too much like a fixed medium, and records and CDs have only made this confusion the mainstream assumption. We need to return to music as a performance art, and we need to recognize the value and authenticity of experience. What is it worth to hear the greatest players playing the greatest music in the greatest halls or rooms? No, I’m not talking about Billy Joel and Sir Elton John playing piano at 125dB in a hockey rink. I’m talking about environments that fulfill music’s highest technical and artistic aspirations. This was the explicit goal of the design of the Music Room. (And to make it sustainable, we made it a carbon neutral recording studio. I look forward to seeing how Ross’s narrative validates or challenges my own. Perhaps he’ll find an excuse to come to Pittsboro NC and hear for himself what a 21st century environment does for twentieth century music.